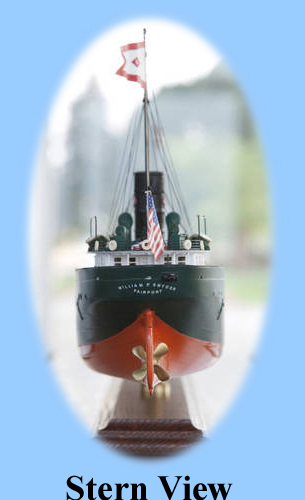 The Ship - The steamship "William P. Snyder" was the first vessel constructed for the fleet of green and orange hulled ore freighters that once belonged to the Shenango Furnace Company in Sharpsville, Pennsylvania. Hull No. 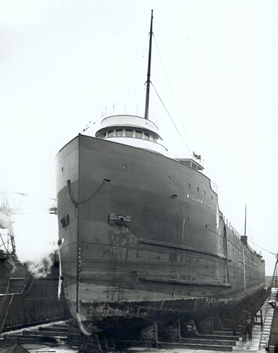 17 was launched in February, 1906 at the Ecorse, Michigan yard of the Great Lakes Engineering Works. A true survivor, the "Snyder" was renamed and rebuilt a number of times over the next 105 years. She currently sails as the cement carrier "St. Marys Challenger" - the oldest operating commercial steamship of her kind in the world. 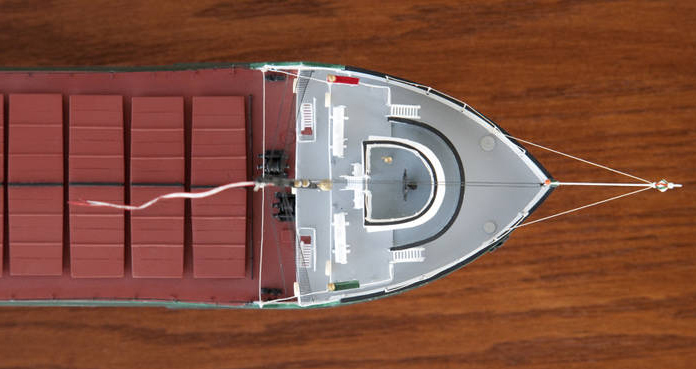 Top view of bow The Model - The "Snyder" is an excellent example of a museum quality model done in 1/16" = 1' scale. The actual vessel is 530 feet long, making the model 33" long, not including the custom "Arts & Crafts" style case. From the tip of her bow to the extreme point of her classic fantail stern, the "Snyder" is perfectly sized to fit on a fireplace mantle or console table. Due to this steamship's legendary longevity on the inland seas, professional advertising and editorial photojournalist, Chris Winters, researched, wrote and self-published what is certainly one of the best color photo history books on a single Great Lakes ship. Winters' "Centennial - Steaming Through The American Century" is available through www.runninglightpress.com and is a "must have" volume for serious students of maritime history. 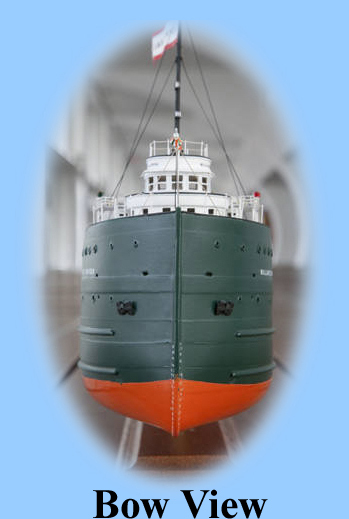 To accompany his traveling book-signings, promotional displays and maritime presentations, Winters commissioned a model of this vessel, as she was originally built in 1906. 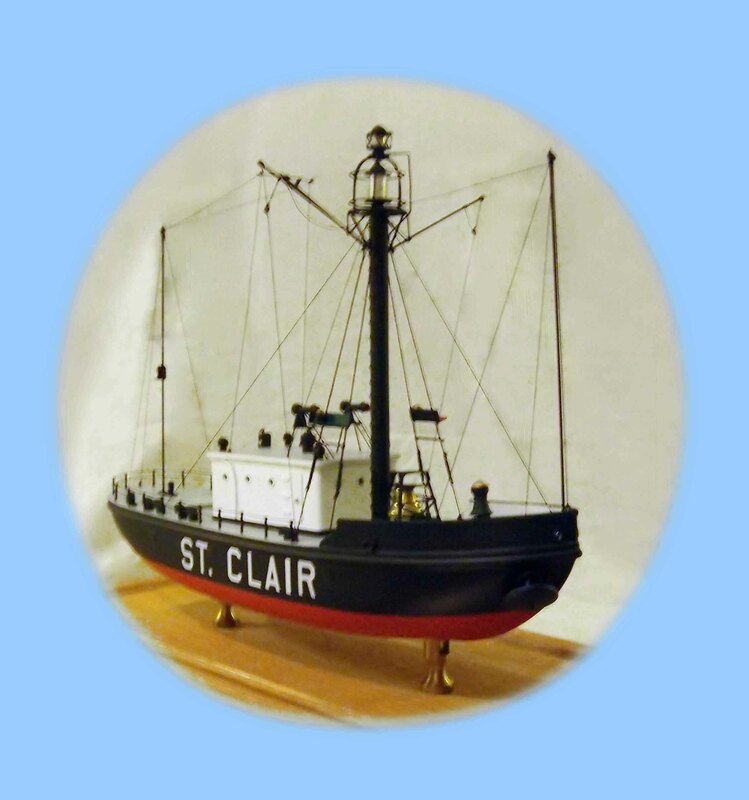 The completed model demonstrates Steffke's skill at replicating one of the most finely and accurately detailed examples of a traditional Great Lakes freighter, in such a small scale. 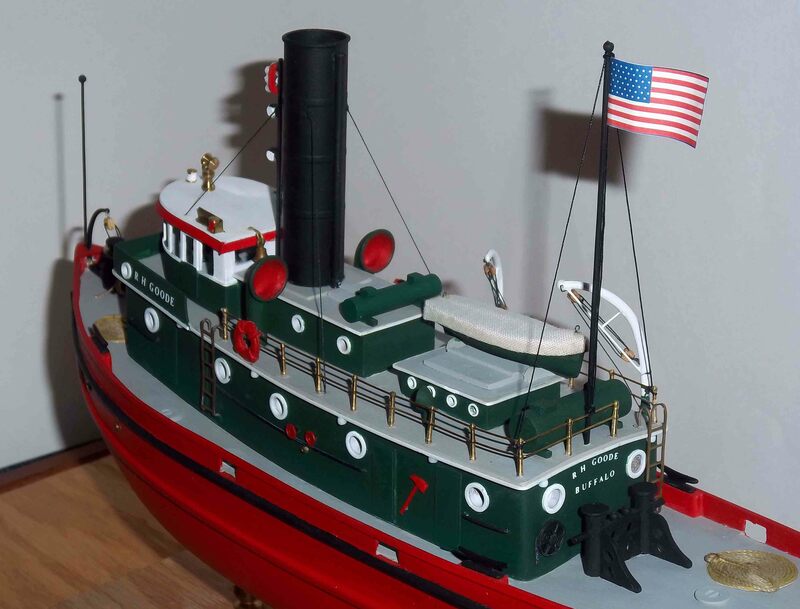 From her fire axes that are just 3/16" of an inch long, to her detailed and multi-colored steering pole copied from a period photograph, Steffke has shown the ship modeler's art at its best. 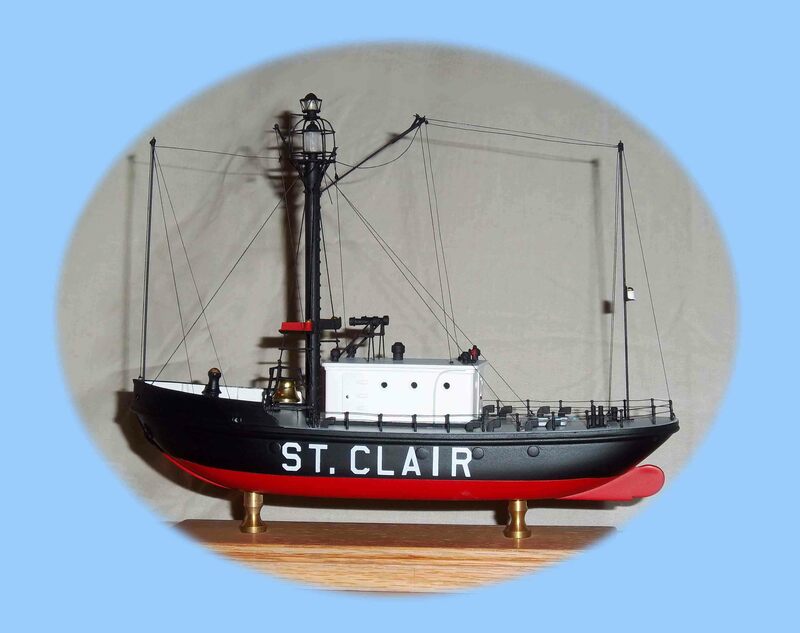 The "William P. Snyder" is one example of the many Great Lakes freighters he has produced in this scale over the years. Light Vessel No.98 - 1915 "BUFFALO"
The Ship - Light Vessel Number 98 was known as the "BUFFALO".This steel "semi-whaleback" Light Vessel No.98, was launched at Muskegon, Michigan by the Racine-Truscott-Shell Lake Boat Company, at their West Michigan yard on June 9, 1914. She was preceded a year before, by an unpowered, near sistership (which had no Jigger Mast and sail), the Light Vessel No. 96. Contrary to popular knowledge and usage, all "lightships" are officially known as Light Vessels and by their Numeric order, not the station that they are assigned to. Thus, LV No.98 was originally ordered to replaced the doomed Light Vessel No. 82. 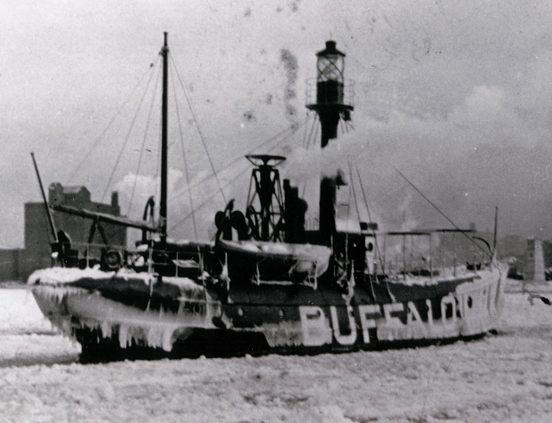 That light vessel was lost with all hands in the Great Storm of 1913 in Lake Erie, marking off the entrance to Buffalo Harbor. 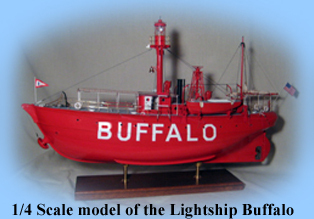 Commonly referred to as the "BUFFALO" Lightship, she was placed on station, after being accepted by the Government, in 1915 and remained there until 1918. She retained her traditional LV No., until taken over by the U.S. Coast Guard in 1935. Then she was redesignated as WAL 521, and moved to many locations over her life. In 1919-1920 she served as a "Relief" light vessel for the 12th Light House District (Great Lakes). In 1920-1928, she became "Lansing Shoal" lightship, and served as a "Relief" for the 12th district once again until 1929. In 1930, she was moved to saltwater and the Atlantic Coast and provided marking duties at "Handkerchief Shoal"(MA) until 1951. Her final assignment was to serve as a "Relief" lightship until retired from duty and sold (and presumably scrapped), after 1955. Thus ended a long and varied career for a style of Light Vessel that was considered radical and innovative for her time. Midship Section detail showing the Leslie Typhoon Fog Siren The Model - Constructing the LV No. 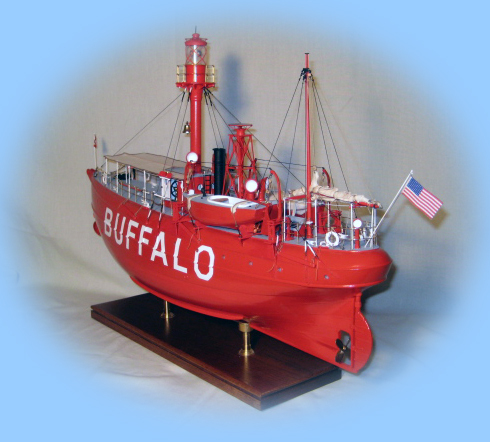 98 "BUFFALO" was quite a challenge, due to its unique hull shape. The hull was constructed using the traditional "Builder's Scale" (1/4" = 1') method of cutting out each "lift", gluing them together, then finally shaping with razor sharp Swiss wood-carving chisels. 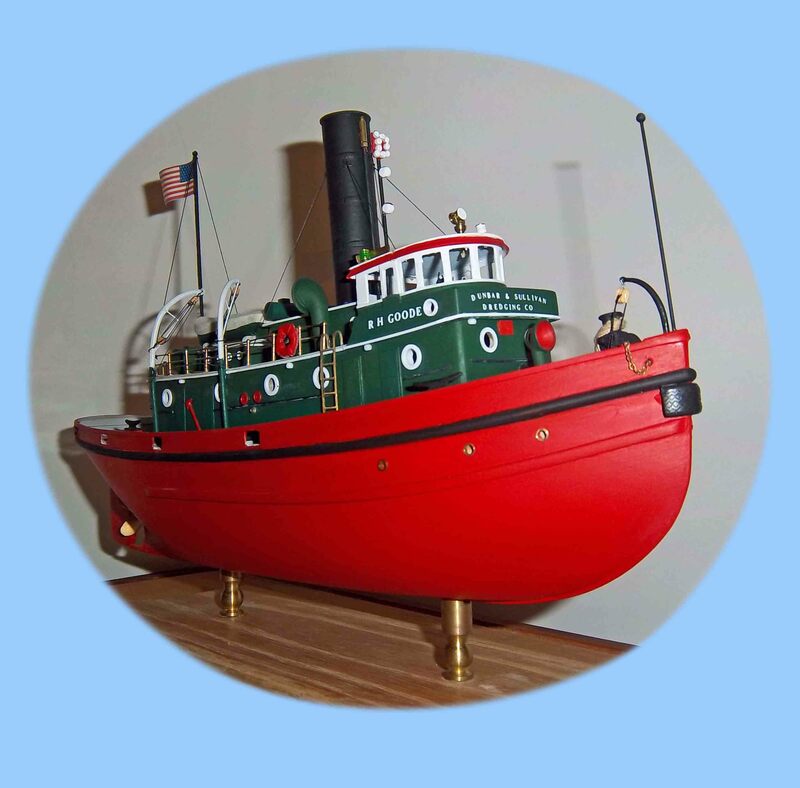 This type of Lightship was a "semi-Whaleback" hull, that somewhat resembled the "Pigboats" built by Captain Alexander McDougall of Duluth, Minnesota, in the 1890's. These Lightships also had new or transitional forms of navigational equipment and safety features. The Leslie Typhoon Fog signal was constructed piece by piece, with all four sides of the lattice shaped tower matching each other. The gravity activated Stewart-style Lifeboat Davits were also challenging due to their complex shape and no good drawings to work from. Since this model was made in such a large scale, the hollow lantern mast tower allowed a detailed example of a rotating Parabolic Four Mirrored Lens light. The Port side door to the pilothouse was left open to show the door entrance to the Lantern Mast, the officer's "Seat of Ease", and the steering wheel. The steering wheel alone, for this model, was made up of nine separate pieces which were laser cut for accuracy. 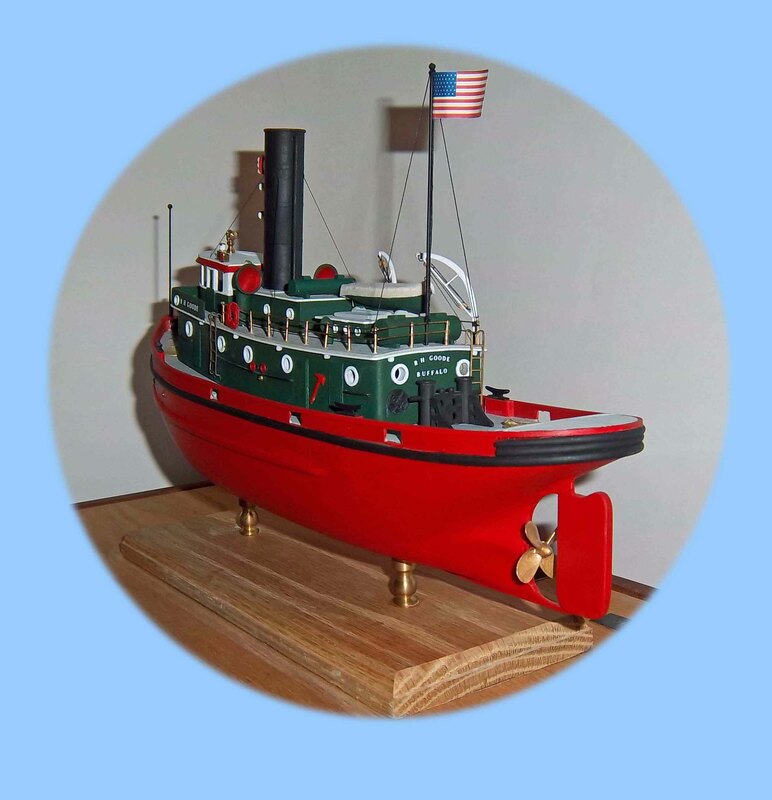 Nick-named the "Giant Red Egg" when she was under construction, Steffke truly appreciated the skill of the original shipbuilder's of this somewhat experimental Lightship once it was done! 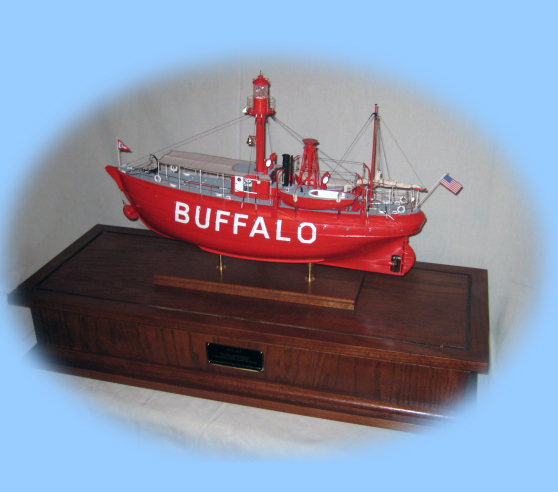 She now sits proudly in her owner's living room in Buffalo, New York, and is greatly admired by all of the fellow marine historians who visit. Light Vessel No.75 - 1930s "St. Clair"
The Ship - With an approved Congressional appropriation of just under $15,000 to work with, the Johnson Brothers Boiler Works of Ferrysburg, Michigan, won the contract to build Light Vessel No 75 in 1902. This steel lightship was built as a non-powered barge to be manned by a crew of six men. It was originally located in Lake St. Clair, at the turn in the navigation channel that leads to the U.S. Ship Canal Channel. From there, vessels negotiated their way through the St. Clair River delta, known as the "Flats", that includes Harsens Island as its main landmark. She was towed to and from her appointed station each spring and fall by a tug to the U.S. Lighthouse Depot located in Detroit at the foot of Mt. Elliott Street. 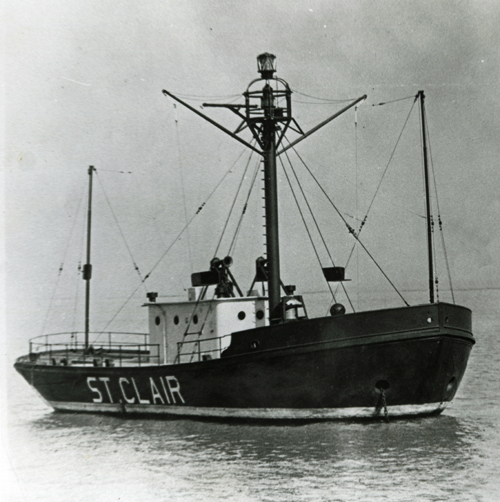 Originally called the "Grosse Point(e)" light vessel, number 75's name was simplified in 1911 to the more readable "St. Clair" in bold white letters. In 1926, this light vessel became an experiment in self-automated operation. 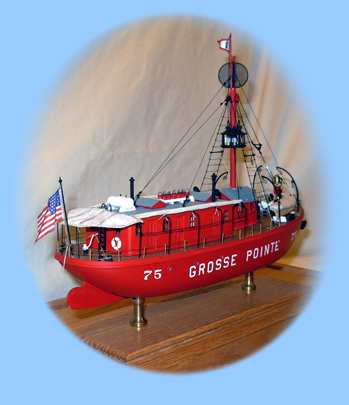 By using back-up generators, complex battery systems, and remote controlled radio signals from the Detroit depot initially, this lightship became the first unmanned example of its kind in the United States. She was retired from the U.S. Coast Guard and sold as surplus equipment in 1939. 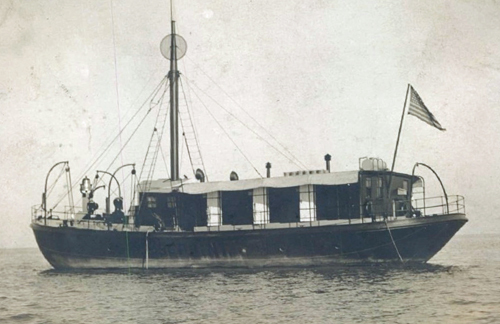 Purchased by private interests, she was converted to a gasoline powered barge and eventually made her way to New York Harbor where she still works as a lighter - and also serves as the oldest Light Vessel hull in North American waters. Lantern & Radio Mast detail The Model - No plans "as built" or completed of this pioneer lightship exist. This 1/8" = 1' scale model was made based on a 1901 "Marine Review" article and numerous photographs. The model, while relatively simple in hull structure, has many interesting details from the period of her radio controlled existence. 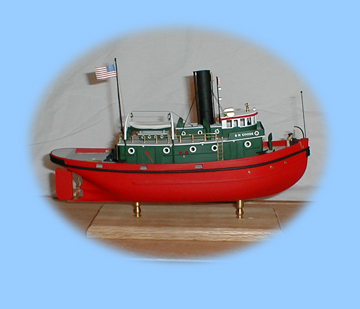 This model shows the vessel in her final configuration (1930-39) before she was sold out of the service. The complex wires and lines coming from her electrified lantern mast are actually the radio wires from which she received and relayed signals. 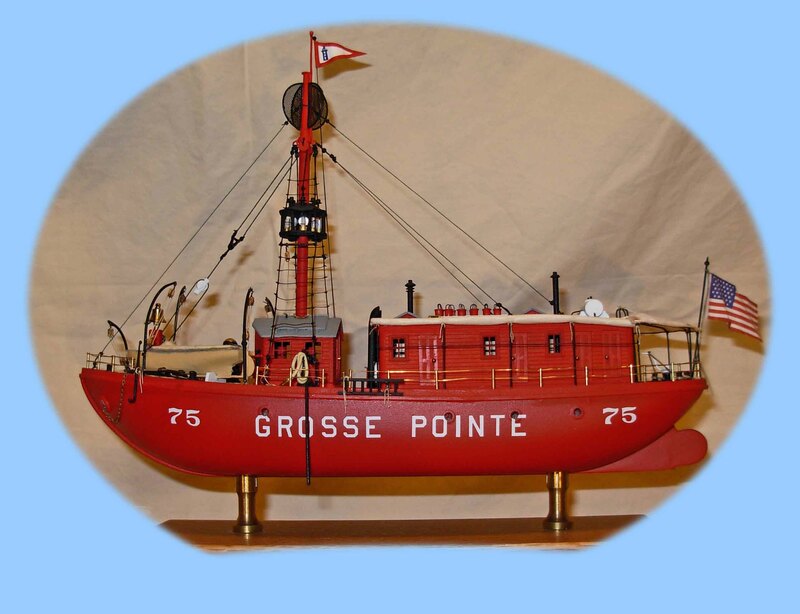 Light Vessel No.75 - "Grosse Pointe"
The Ship - As previously mentioned, Light Vessel No. 75 was rather "stripped down" when she served her "St. Clair" station. 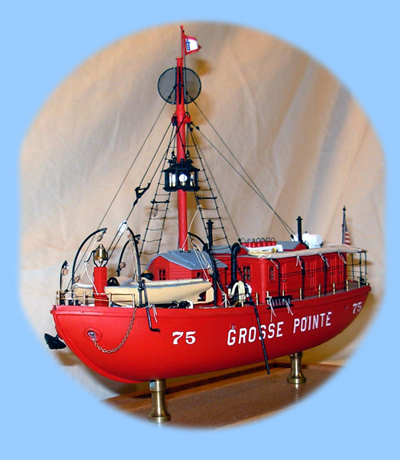 The "Grosse Pointe" originally was constructed to house up to six men and fully accommodate them for the entire shipping season. On the Great Lakes the season starts sometime in March/April and runs until as late as the last week of December. This 84 foot barge was required to have bunking rooms, a "saloon" (read as "Gathering Room", as opposed to a "Bar"), and a fully outfitted Galley. She also had a lantern house that held the light tending room equipment during the day and allowed the beacon to be raised at night. Like most light vessels, she was painted red. Her original black station markings were hard to read during the day, against the dark colored hull. When the lettering was changed to white, the appearance was better but still too small to be easily seen, warranting further changes. 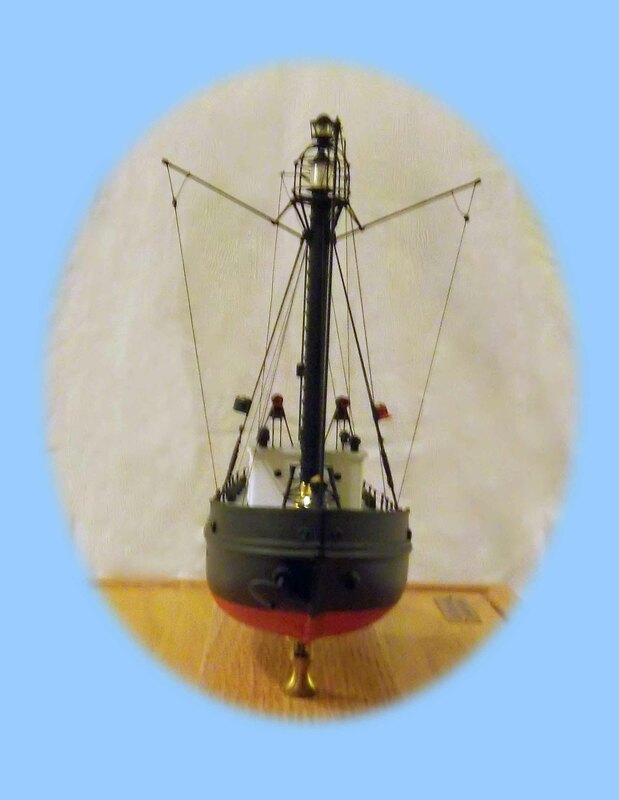 Fortunately, despite the lack of plans, many good early photos of this lightship exist so that an accurate model could be made. Detail of Light ship The Model - A Detroit Free Press article, discovered from 1903, provided a great deal of detail while researching the original configuration of this ship for an 1/8" scale model (frequently called the "American Museum Scale"). From the Port side freshwater pump, to the hand operated fog signal bell, a very accurate model of this ship was produced. 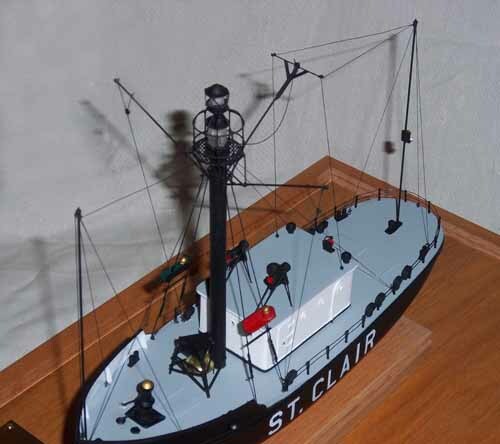 Meticulous attention to detail was taken to show the vessel as it would be seen at night, complete with the multi-lantern signal hoisted up the mast, just below the round wire Day Marker, frequently called the "Spencer". 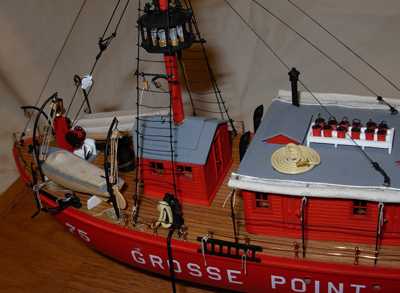 This model of the manned "Grosse Pointe", compared to the radio-controlled configuration "St. Clair"(above) starkly contrasts the changes that took place on one vessel in just a few years. The pair serve as an excellent visual aid showing the development of navigational equipment on the Great Lakes. 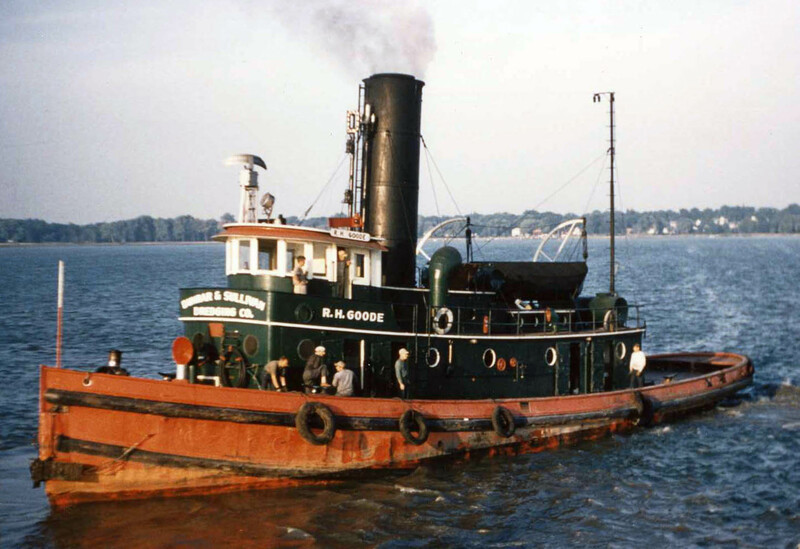 The Ship - The steam powered tug "R. H. Goode" was built to be the flagship of the Dunbar and Sullivan Dredging Company by the Great Lakes Engineering Works. She was hull number 278, launched in 1931 at their River Rouge yard during the depths of the Great Depression. While a beautiful vessel, she had an unusually low metacentric height (the point on a vessel in which buoyancy is lost), due to the high placement of both her steam engine and boiler. Unfortunately, during her acceptance trials and with the owners on board, the "Goode" almost capsized during her Inclination Testing. She was immediately sent back to the shipyard, dry docked, and large, side Bilge Keels were installed in an attempted to stabilize her. She proved to be a very powerful but "tender" vessel to run, until she was converted to a diesel rig in 1958. After her conversion she was considered an excellent long distance towing & general use harbor tug. 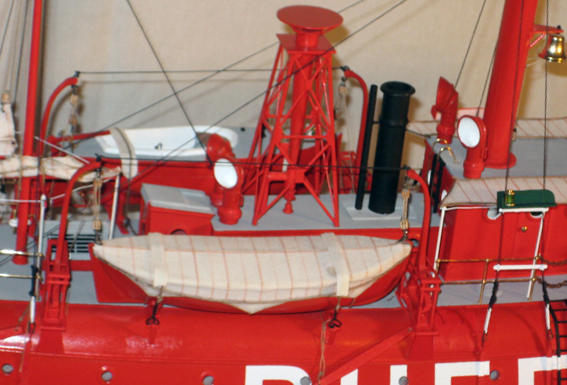 Detail of the tug The Model(s) - This saltwater styled tug "R. H. Goode" was captained by the former fleet engineer of the Dunbar & Sullivan Dredging Company, the late Roger A. Stahl. Captain Stahl commissioned Steffke to build a model of her in her traditional steam livery, with the company's distinctive Hunter Green and Fire Engine Red colors. He also commissioned an additional model of the vessel as she looked after she had been modernized with a new diesel engine, Kort Nozzle, and a complete overhaul of her cabins, among other improvements. Stahl was so pleased with these 1/8" scale models, that he sent pictures of them in Christmas cards to all of his retired Great Lakes friends. Maritime themed Christmas Cards (sometimes just a copy of an historic photo with a message written on the back) is a tradition amongst the Great Lakes maritime community dating back to at least the 1930's. Many "Downriver" residents still remember this colorful fleet of Tugs, Barges and Dredging equipment as their Detroit area headquarters were once located on Stoney Island, located just east of Grosse Ile. For a company that was over 130 years old when it finally liquidated in the 1980's, there are surprisingly few models of any of their vessels.